Continuing from our last blog, we look at simple and natural ways you can benefit from a restful and restorative night’s sleep. Adenosine is a bodily substance that makes us feel sleepy, but caffeine is an adenosine receptor antagonist. Educate yourself in caffeine levels and make a few adjustments to your daily intake. Bear in mind that caffeine is a drug with a half-life of 3-5 hours, so it can take anything up to 14 hours to eliminate its effects from your system. As little as 100mg of caffeine in the morning – a medium sized cup of coffee – can interrupt your sleep at the end of the day. Millions of us metabolize caffeine more slowly than others, so that rush you need mid-morning can sometimes be deferred. Lavender oil is specifically useful in promoting light sleep, whilst chamomile oil treats anxiety and can act as a mild sedative. Add a few drops of either or both to your bedtime bath, or burn a little oil in a diffuser to create a calming atmosphere in your bedroom before you climb into bed. Herbs like lemon balm, passion flower, magnolia and valerian root are other natural antidotes to sleeplessness, so look for teas, creams and supplements with these ingredients in your local health food shop. Supplements are another avenue to explore if you’re struggling to wind down at night. Magnesium is a calmative mineral which can encourage sleep, plus it’s non-addictive, unlike some prescription sleeping pills. We’ve already discussed how melatonin promotes deep sleep, but did you know you can boost your daily dose by eating the right foods? Eating melatonin-rich foods can help reset your circadian rhythm and deepen your REM sleep stage (where a lot of the best repair work takes place.) Flax, pumpkin and poppy seeds are all melatonin-rich, as are cherries, eggs, bananas and lentils. Getting up and going to bed at the same time every day will reinforce your body’s sensitive sleep-wake cycle, and helps you sleep better in the long term. It might be a hard resolution to stick to at weekends, but the more consistent you are, the quicker your mind and body will learn when to feel sleepy and when to become alert again. One condition, though: if you struggle to fall asleep, give yourself 15 minutes and if you’re still awake, do something to help you to nod off. Read a book, put the radio on low or adjust your pillows. If your sleep cycle is disturbed by your own snoring, then we recommend trying an anti-snoring mouth guard which is designed to move your lower jaw slightly forward while you sleep. This opens the airway at the back of the throat, reducing or completely ceasing the vibration which causes troublesome snoring sounds which can disturb restorative REM sleep. To buy SnoreWizard, which includes a money back guarantee, click here. Do you feel truly rested when you wake in the morning? If you can’t answer this question with a definite ‘yes’, then the chances are you’re not sleeping well. Sleep is important. We all know this, but many of us fail to understand just why a good night’s sleep is so vital to our wellbeing. Rejuvenating sleep can be the key to health and wellbeing, but sleep problems can often be the gateway to all manner of subsequent issues. Our time spent asleep is when the body clears harmful toxins from the system, including the brain. Our cells undergo essential repair while we sleep, and children do all their growing while sleeping. Our digestive systems relax while we sleep, as our minds reboot and perform essential maintenance as we slip into deep, REM sleep. 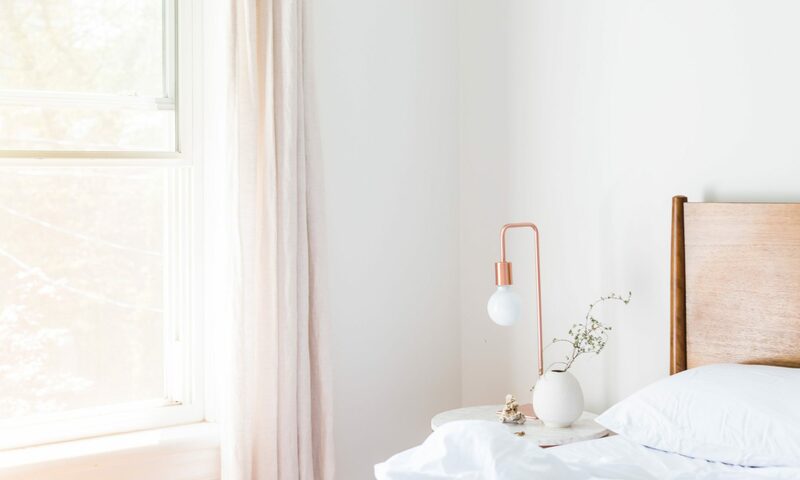 We’re firmly of the belief that there’s nothing complicated about getting into good sleep habits, but we know that the way we live our lives today creates serious obstacles to that deep, restorative sleep so many of us crave. So here are our seven top tips for sleeping better, tonight. A bedroom temperature of 60 to 68 degrees is optimal for most sleepers, whatever the weather’s doing outside. In warmer climates, an oscillating fan or an air conditioner set to 70 degrees will get the bedroom atmosphere just right for a peaceful night’s sleep. If you’re struggling to get comfy, do a simple ‘body scan’ when you get into bed tonight and really try to tune into which areas of your body might be causing discomfort. Adapting your sleeping position and using good quality pillows made of natural fibres – like organic buckwheat – can make all the difference. If your days are physical and you feel stiff or achy at bedtime, some simple yoga stretches could help alleviate discomfort that prevents good sleep. The screens of smartphones, tablets and some laptops emit a blue wavelength that interferes with the neurons in your brain that control your circadian rhythm (which tells your body when to sleep and when to wake). This blue light essentially tells the brain and body that it’s time to wake up – the last thing you need when you’ve been on the go all day. Screen-staring also busies the mind with emails, messages and newsfeeds you should be switching off from at bed time. Simple solution: ban all technology from the bedroom and reach for a good book if you need to occupy yourself for a while before bed. If you must glance at your phone, download the F.lux app which filters the blue light glare. If you’ve banished all phones and tablets from your bedside you’re off to a good start, but many of us still experience a racing mind before bedtime. As little as five minutes’ meditation, practised consistently, can make a world of difference as you slowly become reacquainted with how it feels to be calm and still in both body and mind. Meditation can ease anxiety, depression and physical pain – all obstacles to a good night’s sleep.